Look! 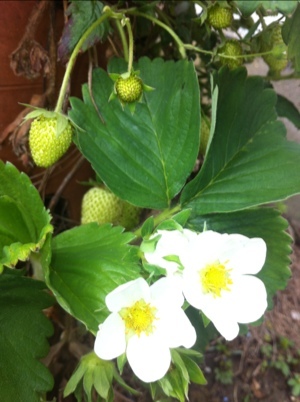 Strawberries! Not as yet as well developed as my parents who live a mile away. Must be the altitude as I live on a hill – theirs are red and look like I should be eating them. 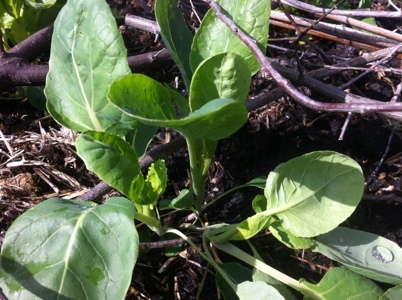 The brussel sprouts are doing well – not yet covered in black fly either so there’s hope yet. 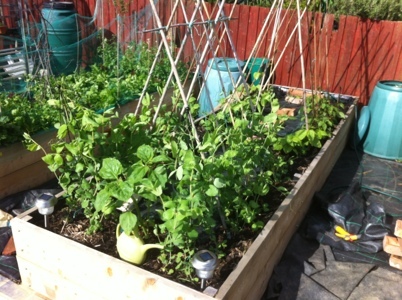 Beans and mangetout are climbing well. I’m not sure how tall giant mangetout get. Last years variety barely manged a foot, we’re well above that, but I think they were a standard variety! Our second set of sweet corn has gone out and is growing fast. Hopefully their growth will be caught on the relocated waarkcam! Something else is also coming along… Only 7 weeks to go…! First pic is the chili and pepper plants I’ve planted up from reduced price plug packs. Second pic is the current herb and salad bed. 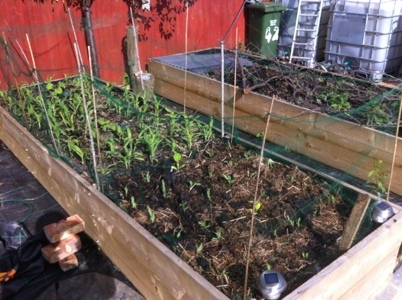 The third bed is the remains of the leeks from last year as well as the new brussel sprout plants. 4th is the onion bed planted in september/october time. The fifth pic is the rhubarb bed. You’d probably not realise that we’ve actually had about 18-19KG of rhubarb from here. Scary stuff, that’s a lot of rhubarb to chomp through. My wife spent Saturday night skinning the rhubarb and chopping it into 1-2″ chunks which is now in the freezer. Freezing is one way to deal with the glut, but there are others! Sixth pic is our fruit bed. My wife made a good decision which was to put the old walk in greenhouse over the fruit bed. We can now stretch netting over it to make a handy moveable cage. The strawberries have been moved from the old bed which was over run with couch grass and the rest had been relocated from the garden path.